What to do with styrofoam? If you look it up this question online you will find a lot of ideas and advice on how to recycle styrofoam. It’s good and you should totally do it. But before you consider any recycling options, please keep in mind that Styrofoam (especially big peaces) are super great for crafts and art with kids. 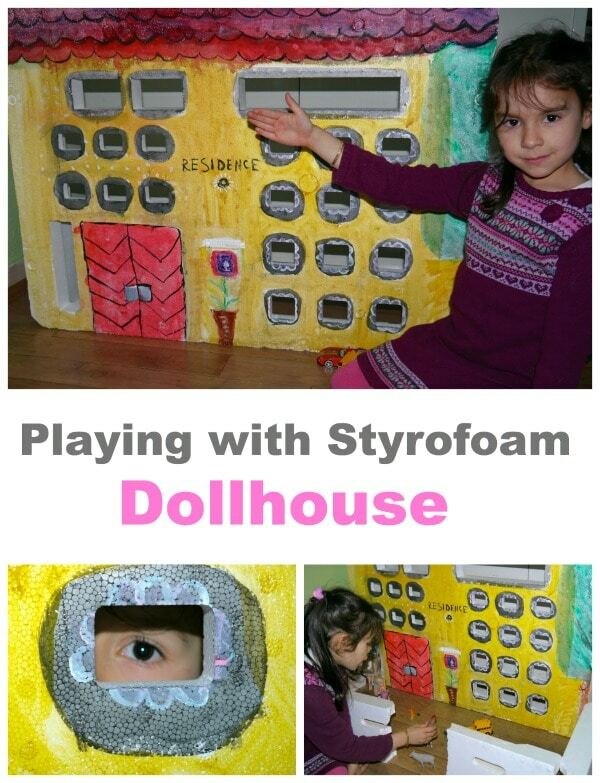 In this post I am sharing how we turned one peace of styrofoam into a dollhouse. Let’s up-cycle! 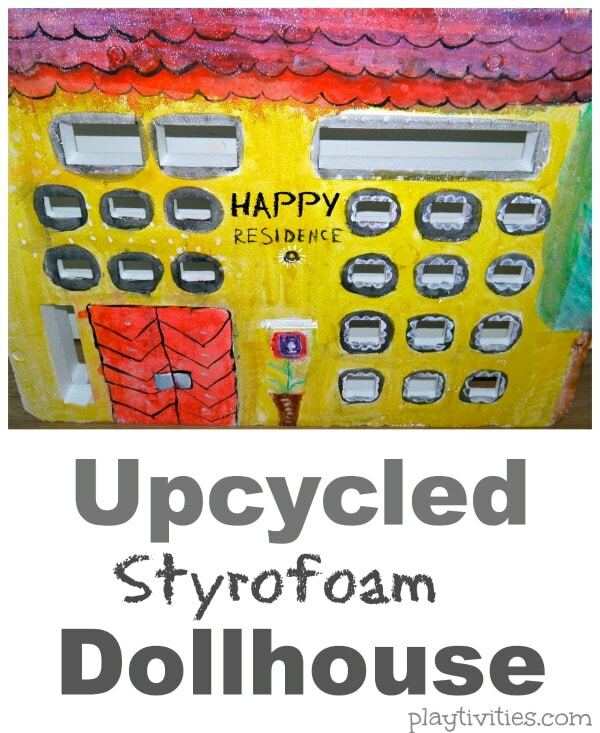 We used acrylic paint to color and decorate our Styrofoam dollhouse, but you can use anything you wish and have in your house. Sky is the limit here. Make sure to involve your kids in making this project. Let them pick the colors and design. It’s part of the activity and a lot of fun. 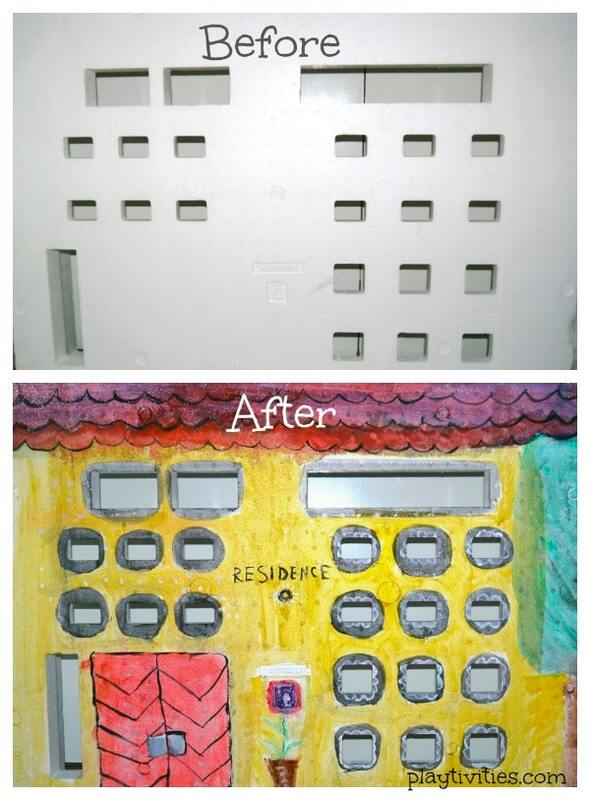 So 1 hour and some painting later we got ourselves A HAPPY RESIDENCE! What to do with Styrofoam? What is great about this particular styrofoam project is that my toddler was able to play too. I gave a bucket of mega blocks and he kept himself occupied for some time by putting the blocks “through the window”. It was great motor skill activity for him. My daughter thought that windows (especially the big ones on top) are a perfect spot to have a puppet show or make her dollies do big speeches and announcements. And what it made even grater that she had plenty more little spots/windows for her other characters to pop up during a story. Endless fun which also improves storytelling skills. 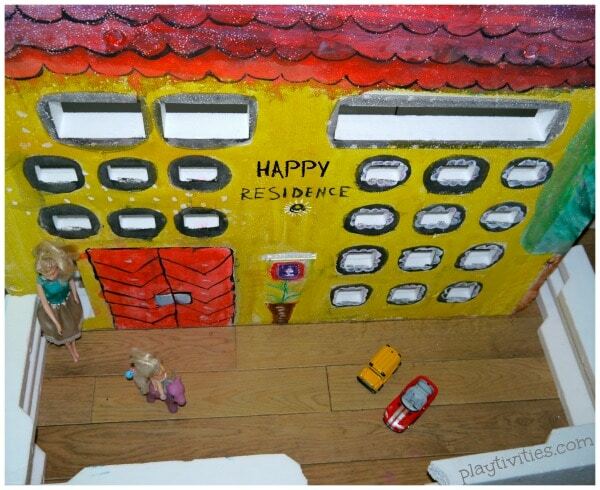 We just made this Happy Residence, but I can tell that it will stay in the house for a while. Kids loved it and had many ideas how to play with it. Try it and next time you see a big styrofoam box, don’t just throw it away. 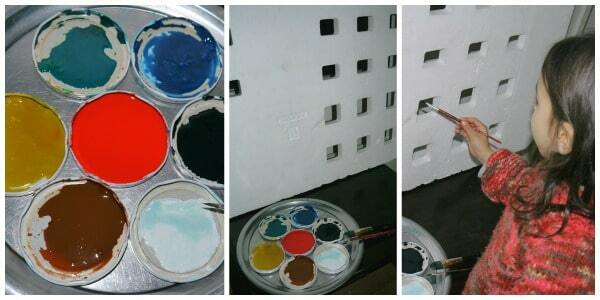 More Ideas about what to do with Styrofoam: Make a camera, fake snow or even a TV. 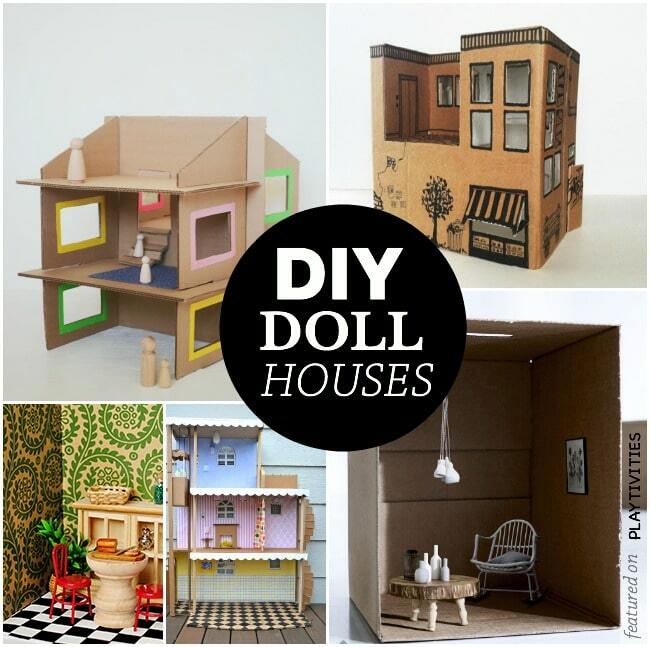 WANT SOME MORE DOLL HOUSE IDEAS? 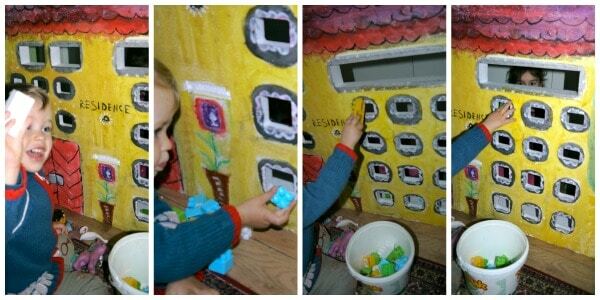 CHECK OUT THIS POST WITH 30 DOLL HOUSE IDEAS. This is precious! 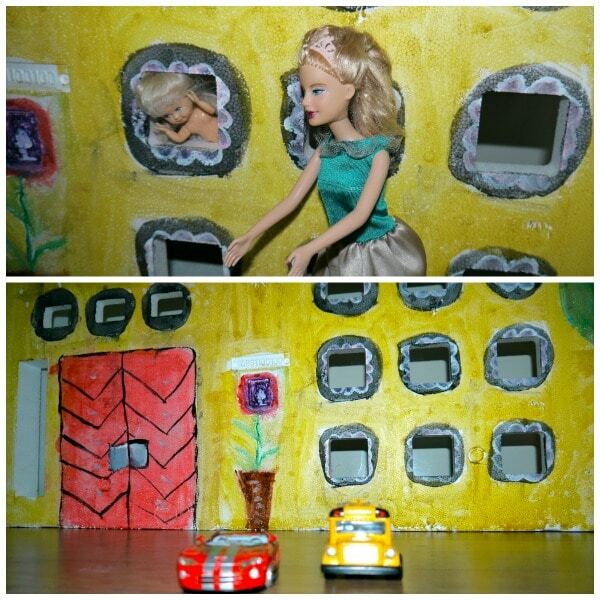 I love that she put her own spin on her own dollhouse! Perfect! This is so impressive. It reminded me of my grandmother, who could always make amazing things out of the unexpected. I love the ideas your daughter had for playing with it too! This is genius! Thank you for sharing.